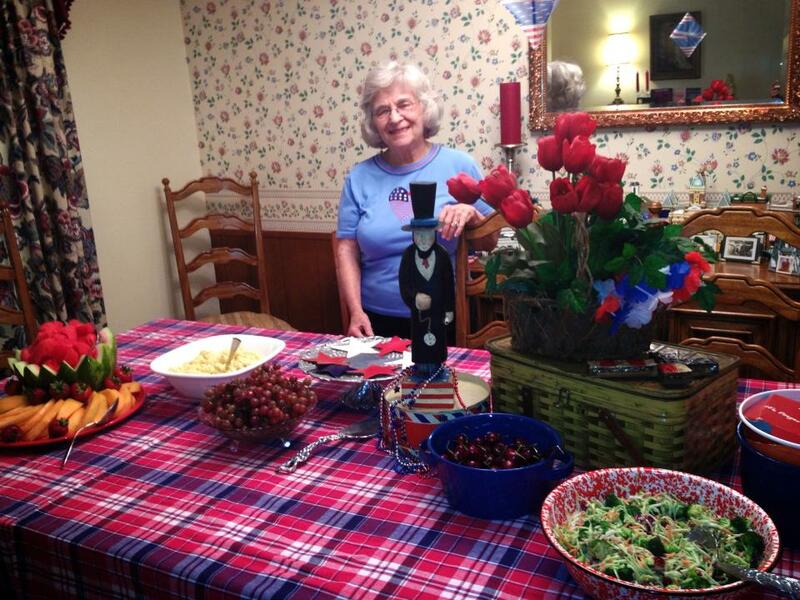 Mom, ready to host her Patriotic Bunko party! Our mom has always been a great hostess. We grew up with wedding showers, bridesmaid luncheons, graduation parties and a host of celebrations large and small. She always allowed us to participate and by doing so, we all learned to entertain and love to! 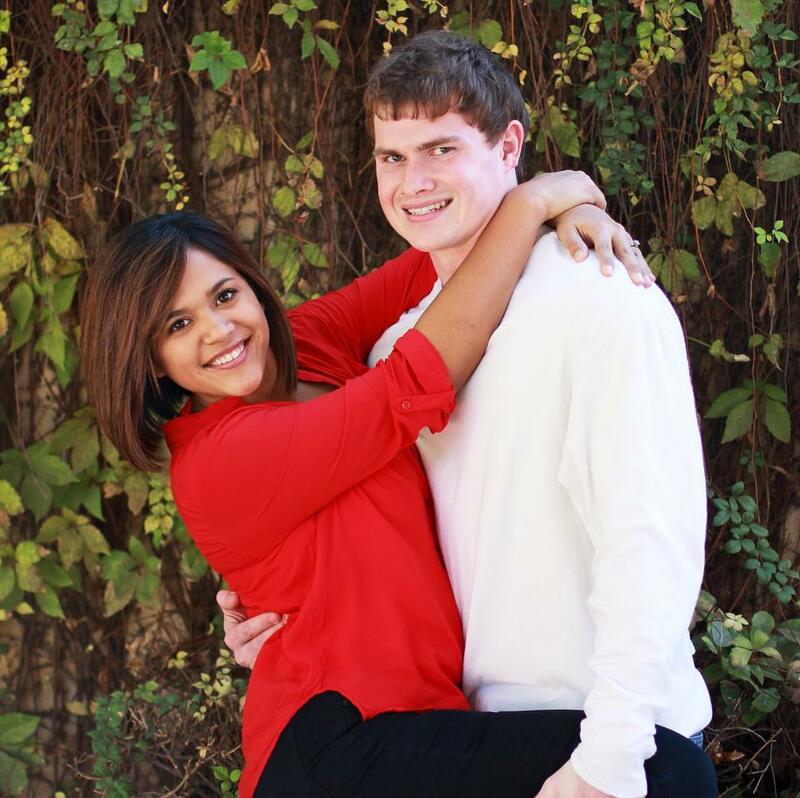 She has a group of friends that take turn hosting their Bunko group. We are so proud that mom hosted this month because she had not done so since she broke her arm, had surgery and survived therapy! 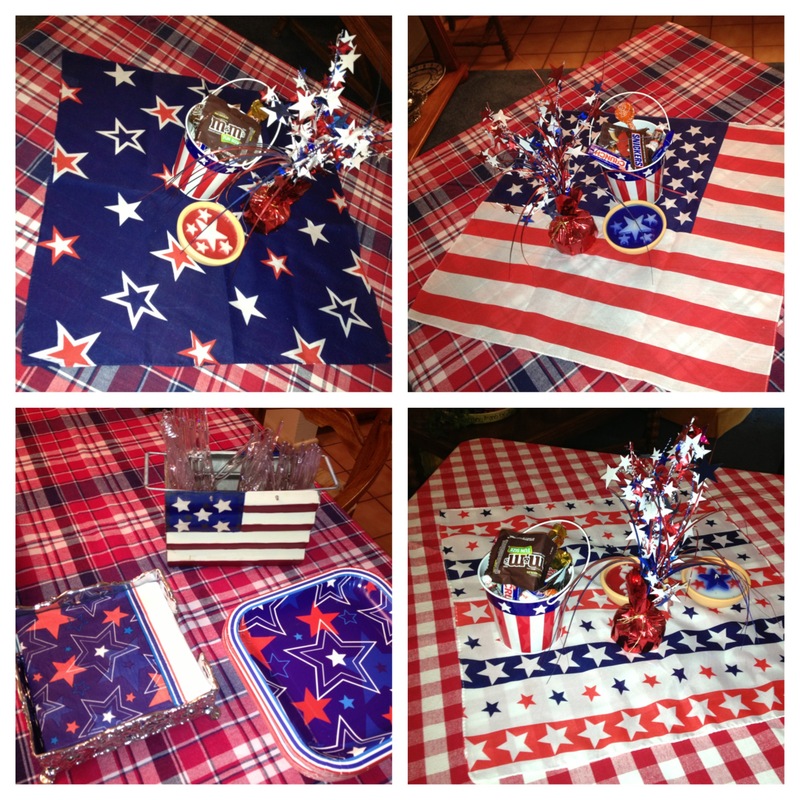 The 1st step to make your entertaining easier is to decide a theme, and because it fell the 1st week of July, a patriotic theme was chosen (plus she had a collection of red, white and blue goodies) So mom gathered up her red, white and blue table cloths, flag squares, patriotic pails (to fill with candy), star centerpiece explosions, and small red, white and blue candles. Card tables were set up for bunko play and her dining table was set to serve buffet style. Bunko tables are set and ready for fun! 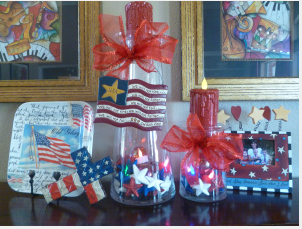 Coordinating Patriotic paper goods mean less clean up! Tip: Investing in washable table cloths allows for multi-purpose use from party to party. 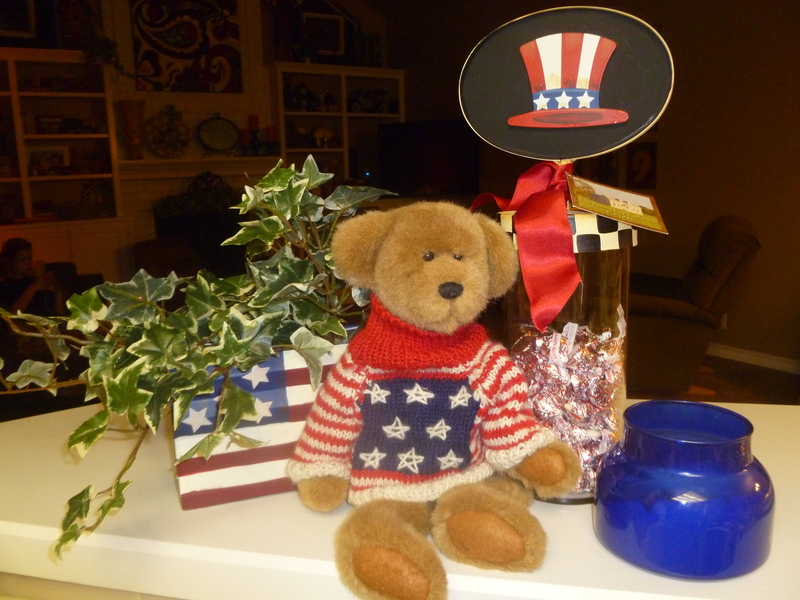 Place table-cloth on table and add collection of patriotic goodies. 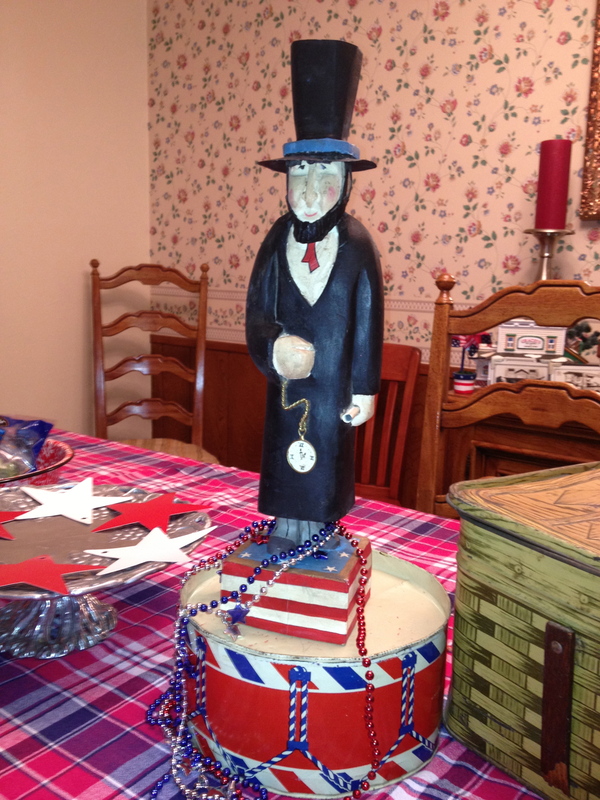 Abe Lincoln stands tall on antique metal lunch box, beaded necklaces (used to mark the bunko) add some whimsy! 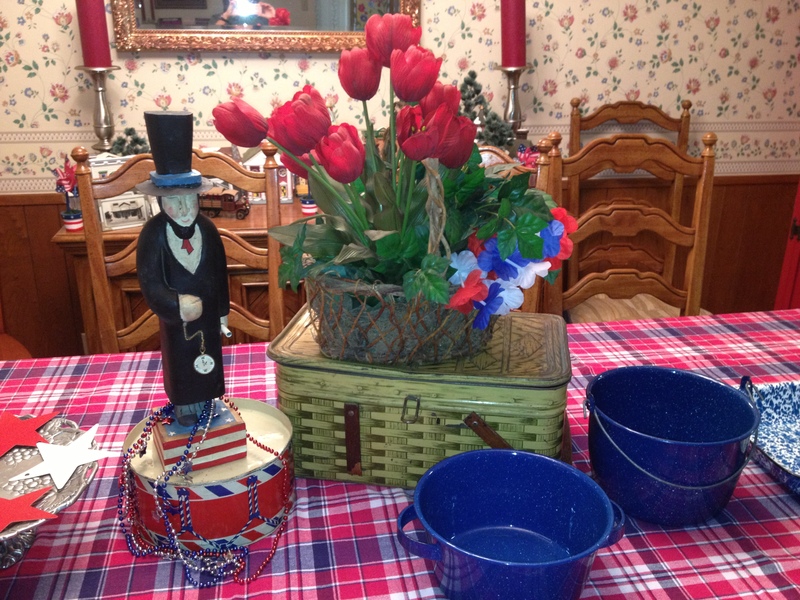 Metal picnic basket elevates the red tulips with a red, white and blue floral garland tucked in. Next was deciding the menu and a picnic theme came to mind, with fried chicken, potato salad, watermelon and Blueberry Ice Box Pie. 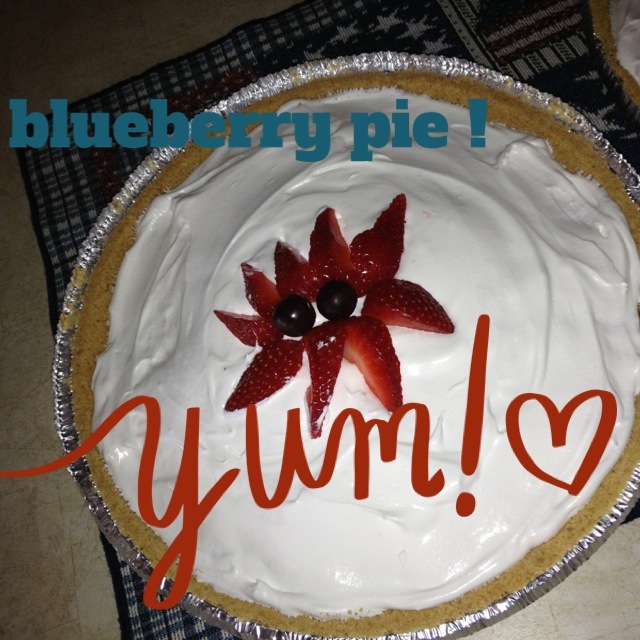 Easy as Pie! 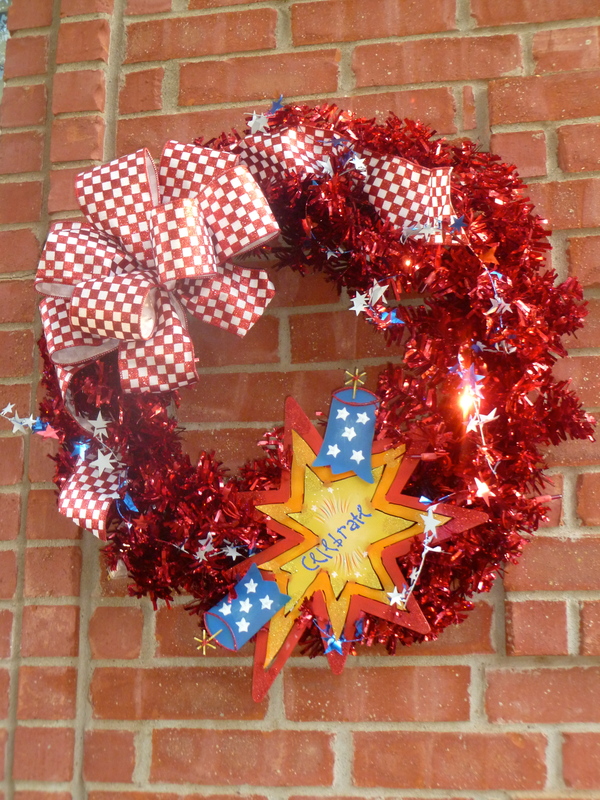 for the 4th of July! 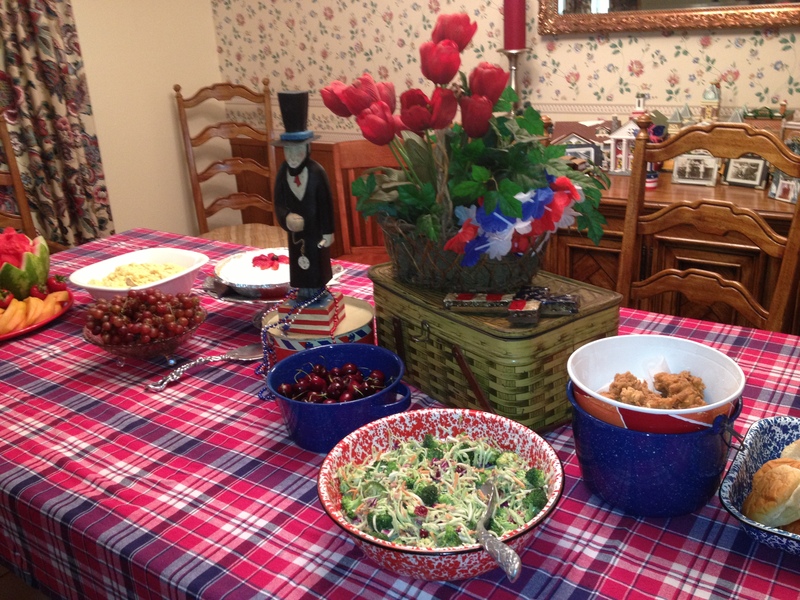 Tip: To enjoy a party, plan food that is pre made: potato salad, broccoli slaw salad kit and fried chicken. (no hot kitchen or last-minute prepping) Serve food in platters and bowls that coordinate with your theme! Platters, bowls and serving pieces were gathered up to coordinate with the table-cloth and marked with post it notes of food they were to hold. 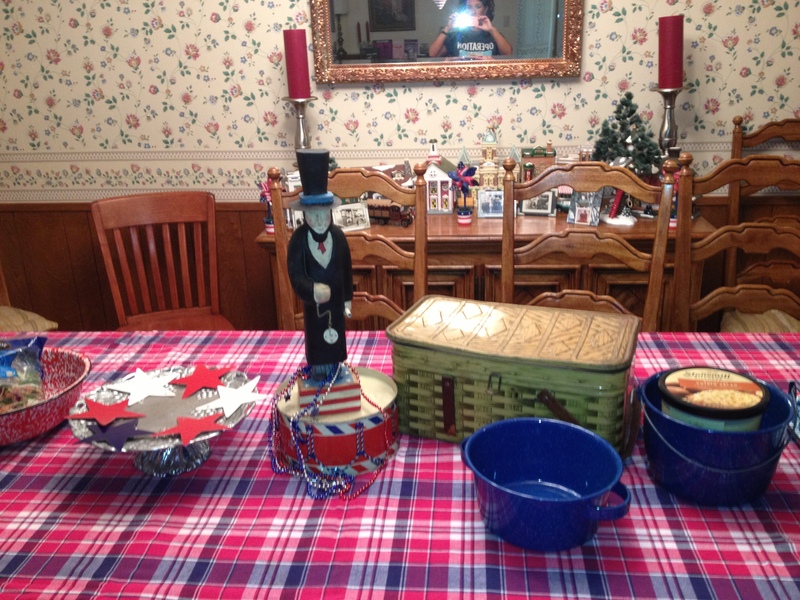 White bowls, red platters and blue specked tin wear were all put to use. 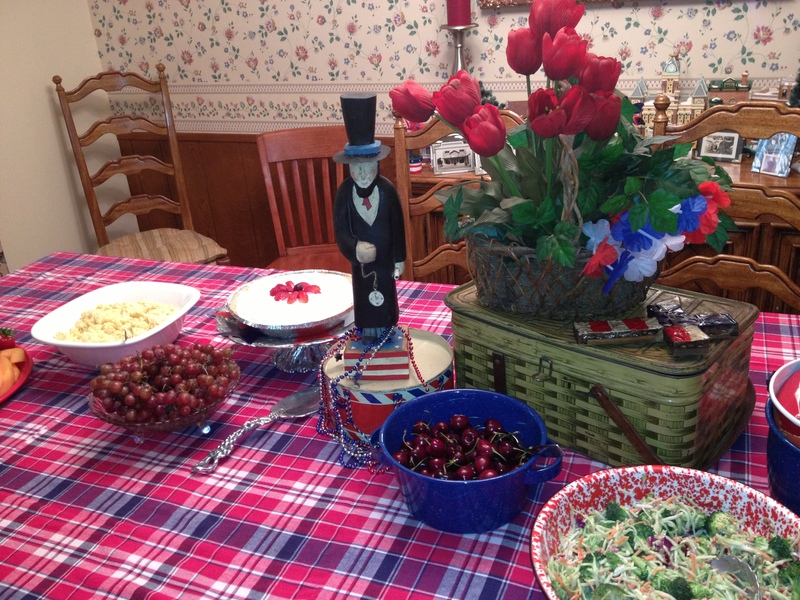 The centerpiece was created from a drum lunch box (mom’s from a high school fundraiser), a metal picnic basket (which belonged to the original Miss Cayce’s), a basket of faux red tulips and ivy (they resides year round on the kitchen table) and an Abraham Lincoln wooden figurine from my collection. A metal cross is displayed on the corner of the picnic basket, a nod to the sacrifice of so many for our freedoms! Tip: When creating a centerpiece, consider shopping your home, bookcases, shelves, cupboards and closets for items that relate to the theme. Use different textures, materials and heights for interest. Now have fun in displaying the food. Fruit is perfect for summer and what says picnic more that a watermelon. 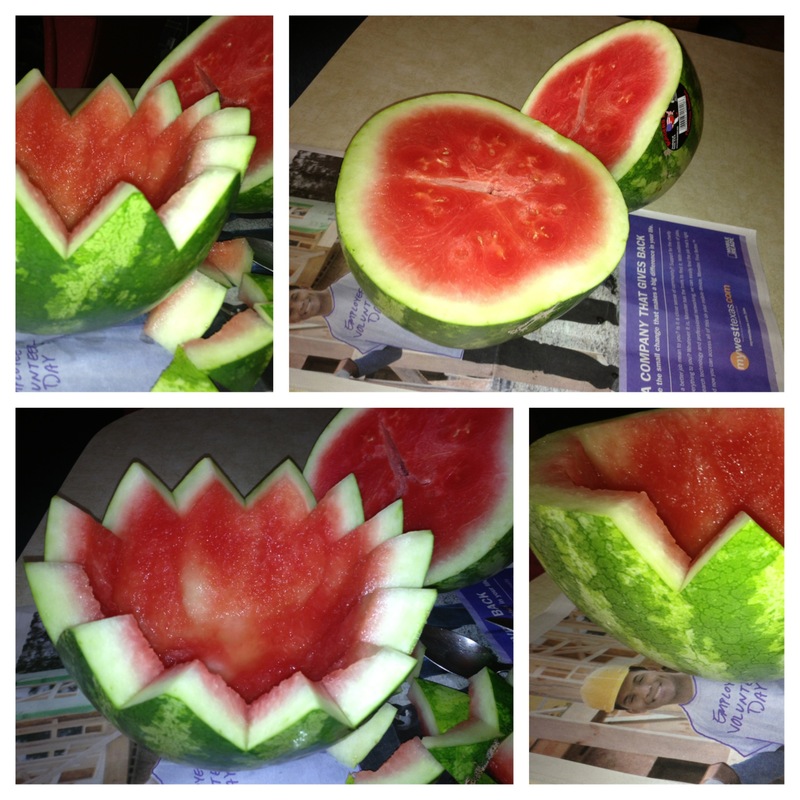 Be creative and scoop out all the melon leaving a bowl you can carve to serve it in. 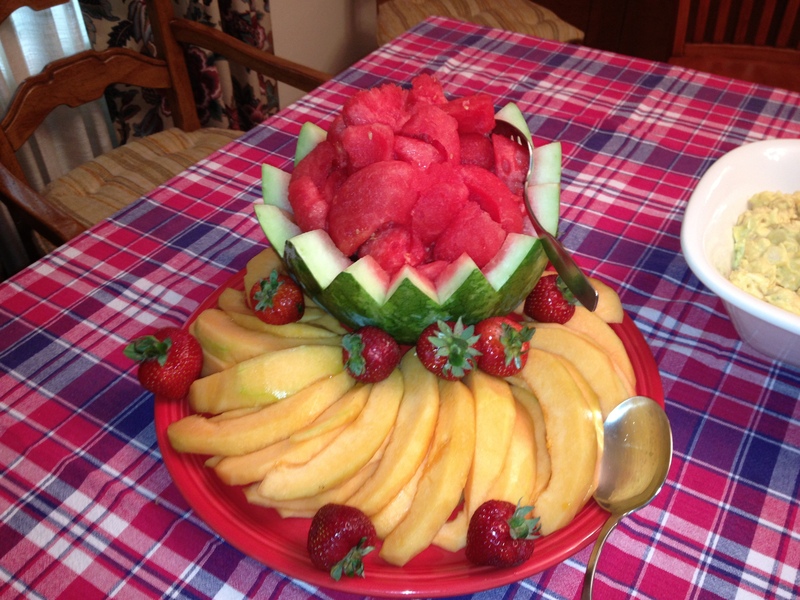 “Watermelon Bowl” and cantaloupe are a refreshing summer time treat! Filled serving bowls and trays become part of the centerpiece, when food is served buffet style. Good food displayed is great food and a fun celebration! 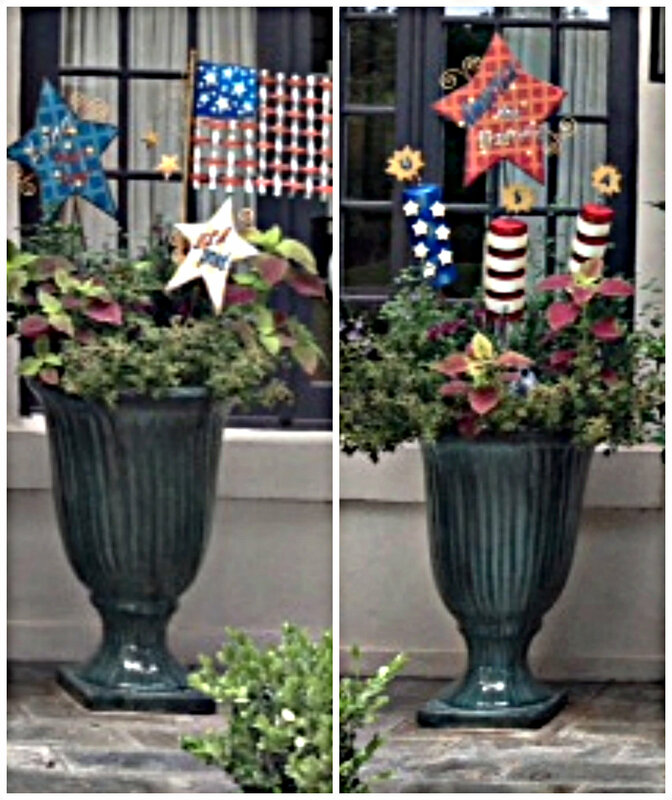 Happy Decorating Y’all and Happy Birthday America! 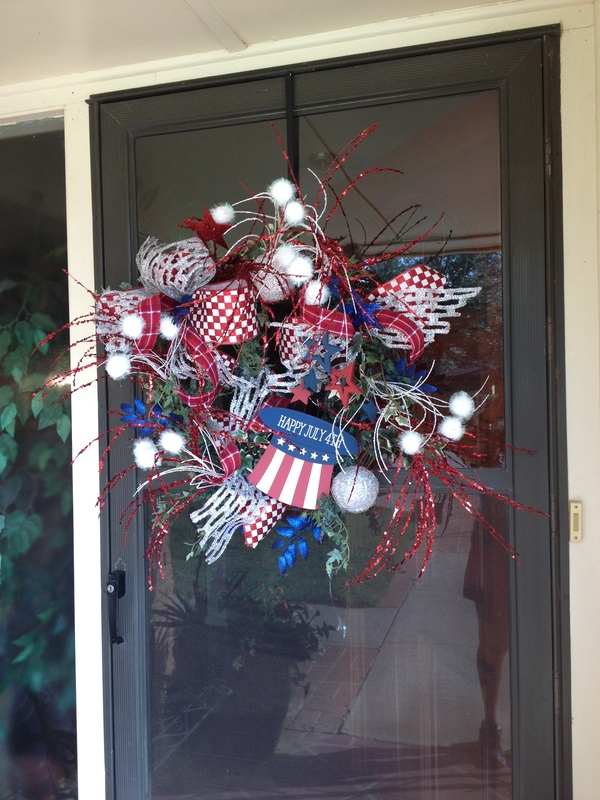 Guest are welcomed at the front door with a fun firecracker popping 4th of July wreath, a hint to the celebration inside! 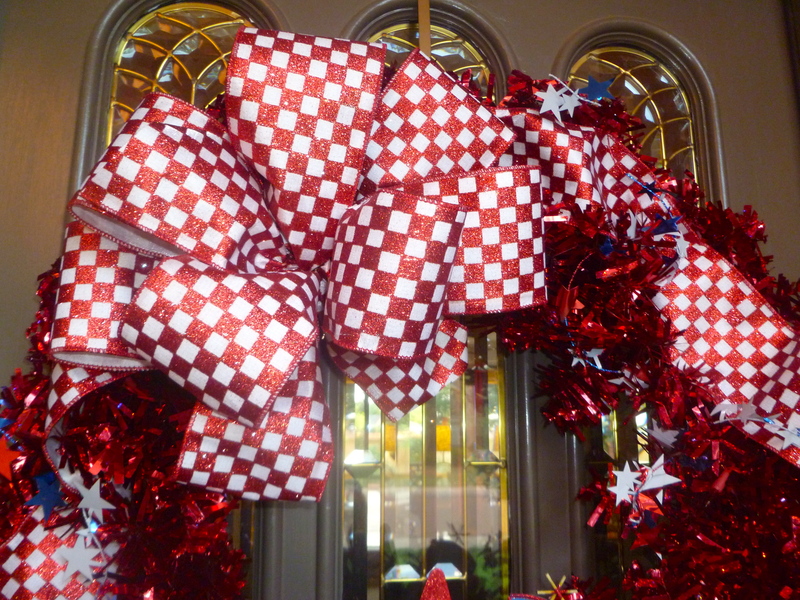 Let’s celebrate all through the house! 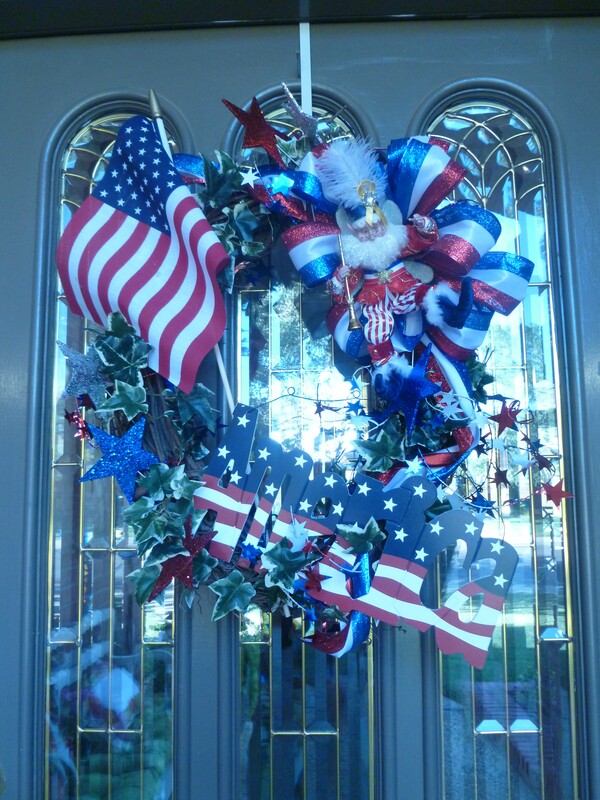 You can start at the front door with a July 4th wreath and @The Round Top Collection has great focal points or pieces to add to your flower pots. 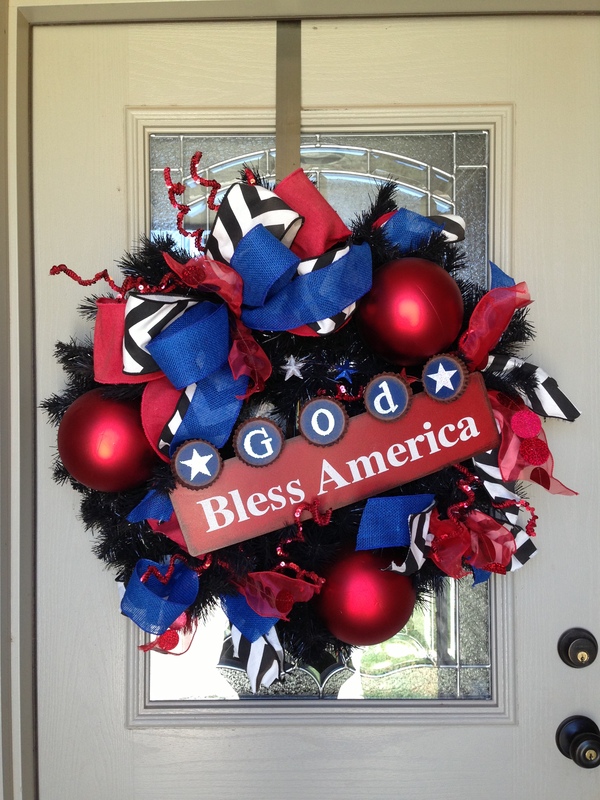 Black Base makes July 4th colors POP! Add a Mark Roberts Fairy! 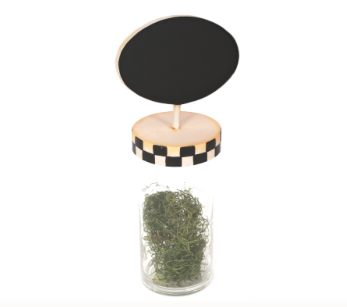 Your focal point can be a part of your collection. 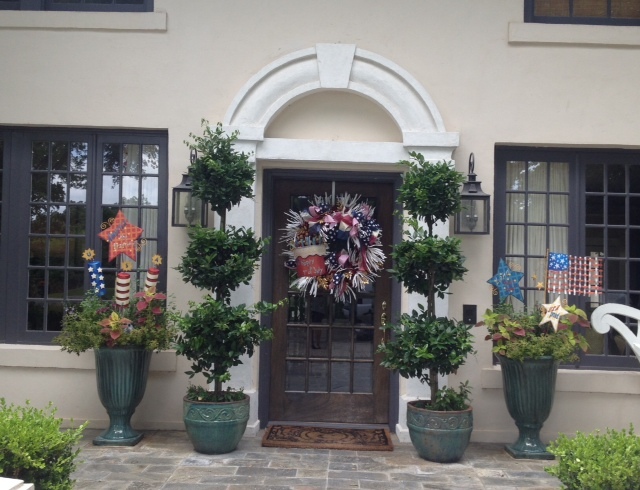 This Mark Roberts Fairy adds a touch of whimsy to the front door. Warm welcome and great 1st impression. 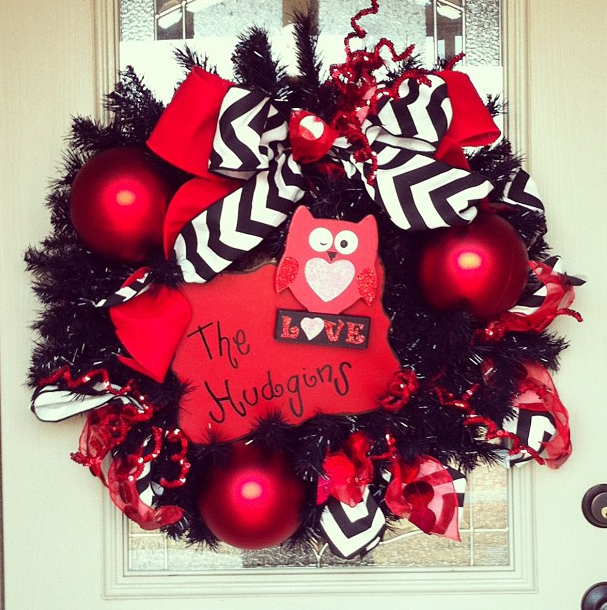 Can you see that we used the same components but each wreath is unique? 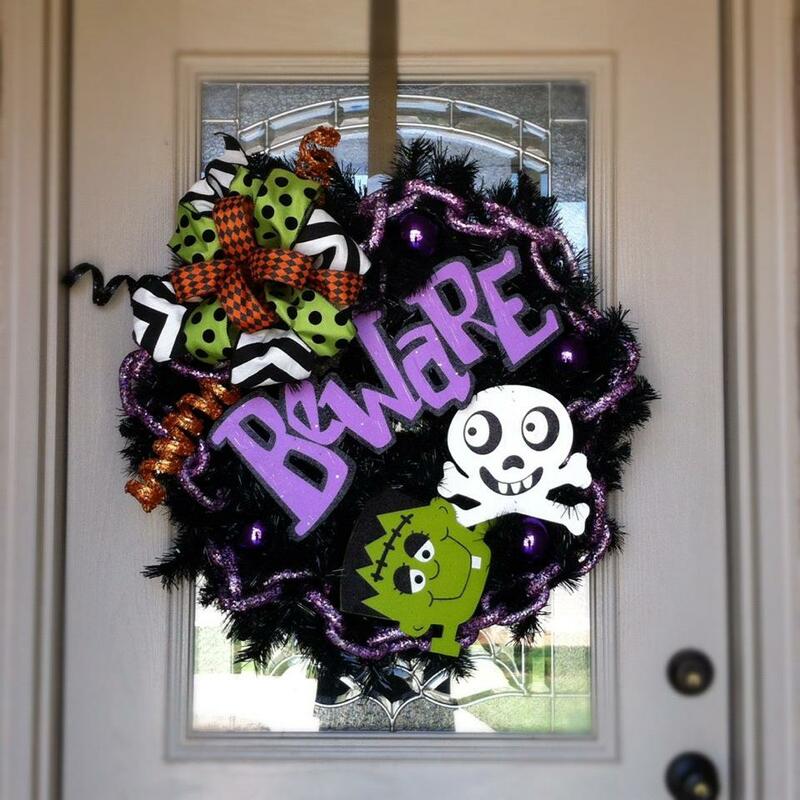 No two doors have to look alike with all of the fabulous decorating ingredients from Show Me Decorating! 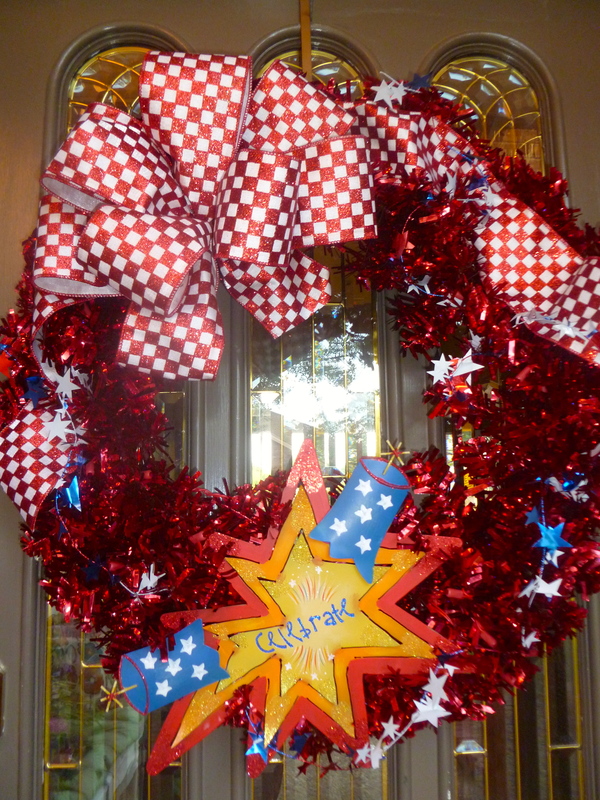 Stay tuned as we take you all through the house for July 4th!